Carolyn: I'm 60 years of age, born in Portsmouth and a Stroke Survivor for 2 years. Carolyn: I was a hairdresser, from when I left school at the age of 15 until the early 1980s, around 1983. Carolyn: Being a manageress of a salon and passing on my skills to youngsters. Carolyn: I'm very proud of my son's achievements as a wonderful father and partner, so the happiest occasion in my life was his birth and then my grandchildren that followed. Carolyn: That I can be able to do the many things that I still cannot do, so I can lead a normal life. Different Strokes: What is your favourite tipple when available and what do you usually prefer when out with friends?. Carolyn: Brandy is my favourite and when out with friends; white wine. Carolyn: My hairdressing that I loved, gardening was a great favourite of mine and going on walks in the country side and holidaying abroad. Carolyn: I do a bit of gardening still but have to sit down to do most of it! Different Strokes: which big-screen film has entertained you most; and who was the screen actor/actress you liked most? Carolyn: West Side Story was a great favourite of mine; Steve Mcqueen was my heartthrob! Different Strokes: Outside of the media of music, films and TV, whom do you admire and respect most? Carolyn: All people who achieve what they set out to do, there are many of these stories in Different Strokes. I hope I can be one of them one day! 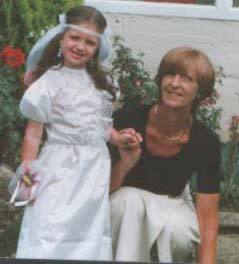 Carolyn pictured about 9 years ago: "Taken in the garden of my house with my lovely granddaughter Jessica." Carolyn has had some hard knocks to cope with in her personal life. Considering the added health issues such as a severe Stroke and broken limbs to cope with, she has put on a very brave face and journeyed on. Carolyn, we all wish you a speedy recovery and Health and happiness in the year 2005. Editor: Carolyn tragically broke her left leg in two places over the Christmas break but very bravely completed this Different Strokes questionnaire for me in early January while still in her hospital bed in Ward D4 of Queen Alexandra hospital. At the time of writing, it appears as if Carolyn will be able to eventually return to her own home. We'll not be quite sure about this until the plaster cast has been removed and the x-rays of her injuries examined by the doctors. Carolyn, I'm glad to say is looking forward to when she can once again join in the Hilsea Harriers' convoys into the city. There was free entertainment on stage in the dockyard bar where Carolyn, Andy and Doug watched the American Country singer, Lisa O'Kane. 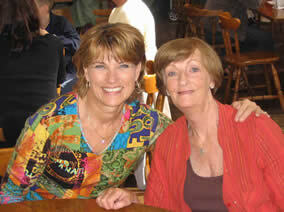 Lisa sat at their table - Here is a pic of Lisa and Carolyn enjoying a chinwag! Fast-forward to May 2008: "I have recovered well from that time in QA, returned to my home and become self-sufficient. I've also once more taken up activities with the Horizon Centre in Cosham and also with our Portsmouth Stroke group."